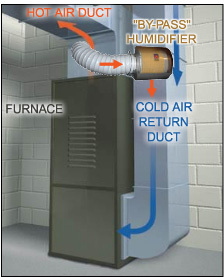 Since humid air will tend to release its humidity when it comes into contact with cold objects, it is generally not recommended that a central furnace humidifier be used in conjunction with a central air conditioner. When the humid air reaches the air conditioner coils (which are very cold), it could cause excessive condensation. On the bright side, very few homes require humidification during the summer months or air conditioning season anyway since warm summer air generally already has a high capacity to hold moisture. Cold winter air, even when the relative humidity level is high, holds limited actual moisture.